Imagine you are taking two friends out to the crag who have never climbed before. You meet at the trailhead and quickly make the approach. On the way in you spot a beautiful looking slab, perfect for introducing some simple movement skills. You tell your buddies to hang out at the base as you scramble around, build a bomber anchor, and drop a rope to set up a base-managed tope rope site. Back at the bottom you run them through all the basic knot/belaying skills and before you know it, you all are ready to climb. You have one of them climb, while the other one belays and you are ready to give a back up belay if necessary. The climber does an awesome job, just cruising all the way to the top, tagging the carabiners at the master point. The belayer tells them to lean back and starts to lower them, but about halfway down the pitch, they just freeze and grab the wall. You try to talk them down, but they are not having it. You can tell they are getting more and more scared the longer they are up there. You do not want this to ruin their experience, especially after they just absolutely crushed it a few minutes earlier... so what do you do? 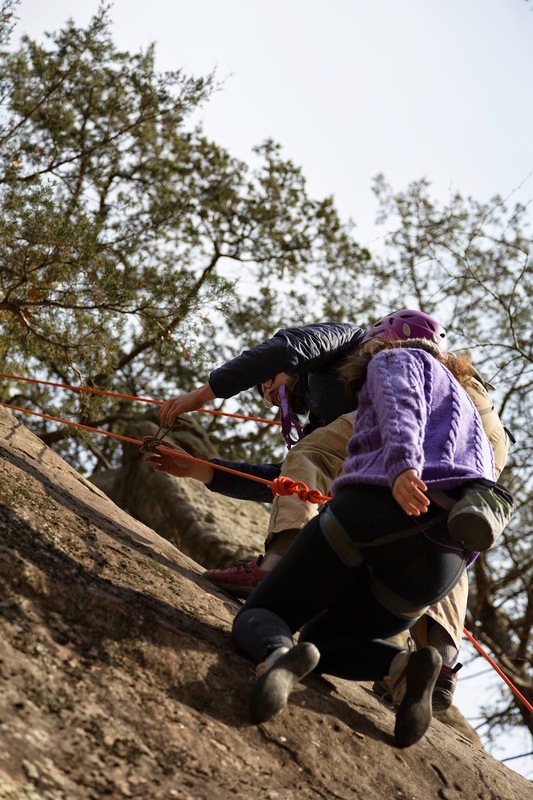 One of the most interesting skills covered by American Alpine Institute (AAI) as part of the American Mountain Guides Association (AMGA) Single Pitch Instructor (SPI) curriculum is top-managed and based-managed assistance skills. In the above situation, you have three climbers operating from a base-managed top rope site. 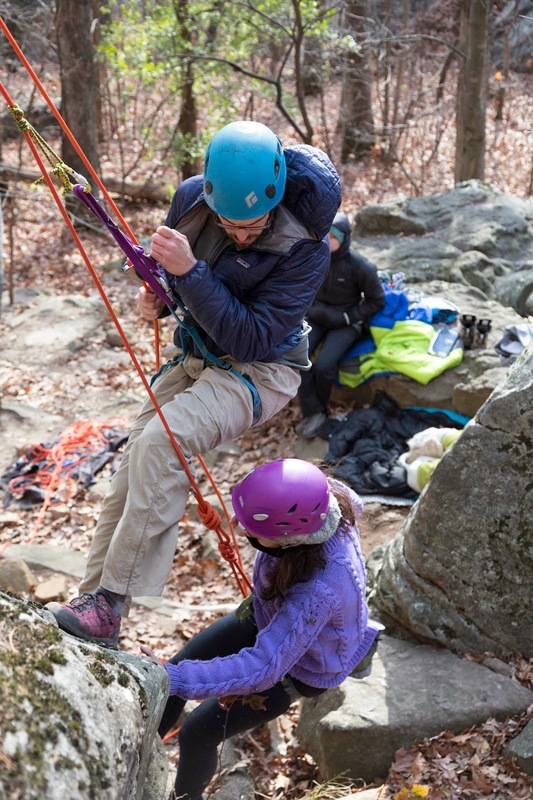 In order for one of the people on the ground to assist the climber being lowered, they would need to counter-ascend the rope to perform a climber pickoff. 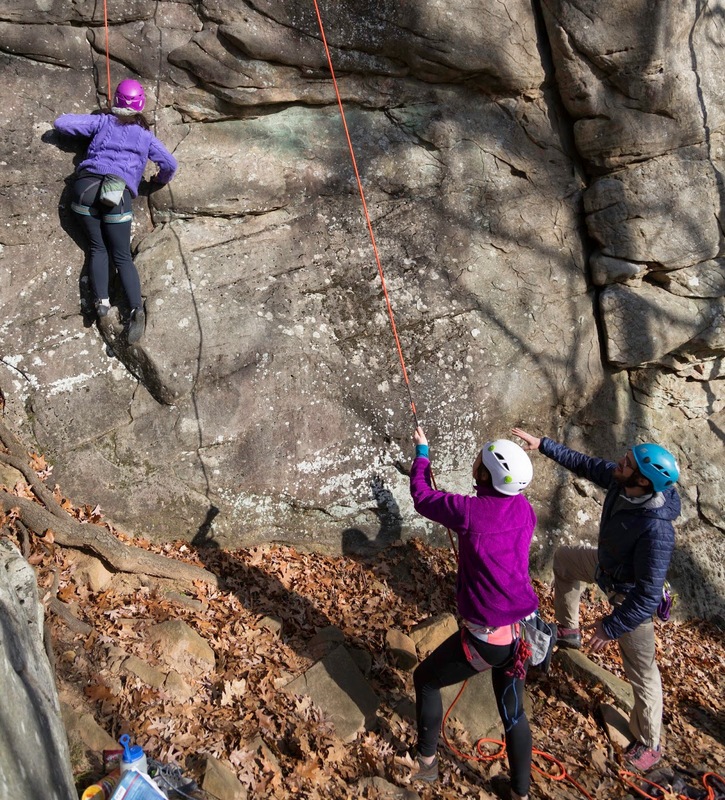 A "pickoff" is any situation where one member of a climbing party has to descend or ascend a rope in order to assist another member of the group who is experiencing difficulty on the pitch. Counter-ascending is a technique where the person ascending the rope uses the weight of the climber on the pitch as a counter-balance to help them maintain their progress as they move up the rope. There are multiple scenarios you could encounter at the crag that would involve using variations of this skill. 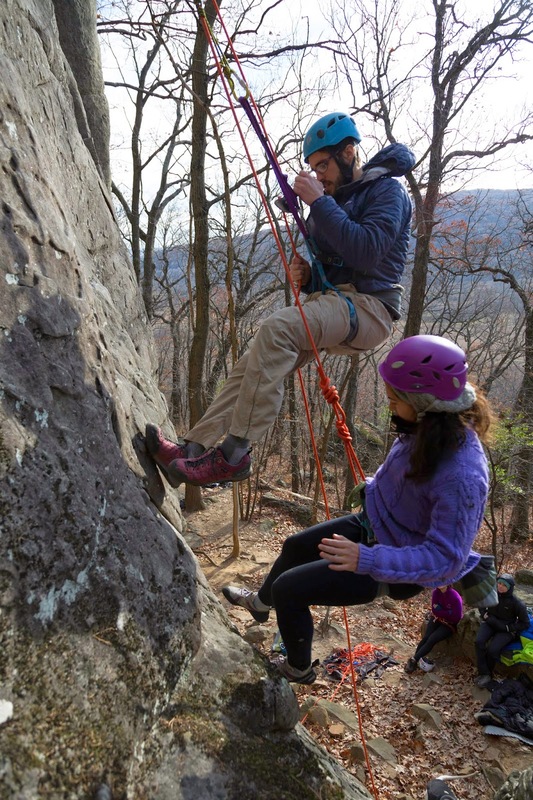 For the purposes of this post we are going to focus primarily on the situation above: Three climbers at a base-managed site with the belayer using either a tube style or assisted-braking style belay device and the most experience climber outside of the primary belay. Have the belayer pull and hold the climber tight. Now tie a backup knot in the brake strand of the rope about two arm’s lengths from the belayer’s brake hand. 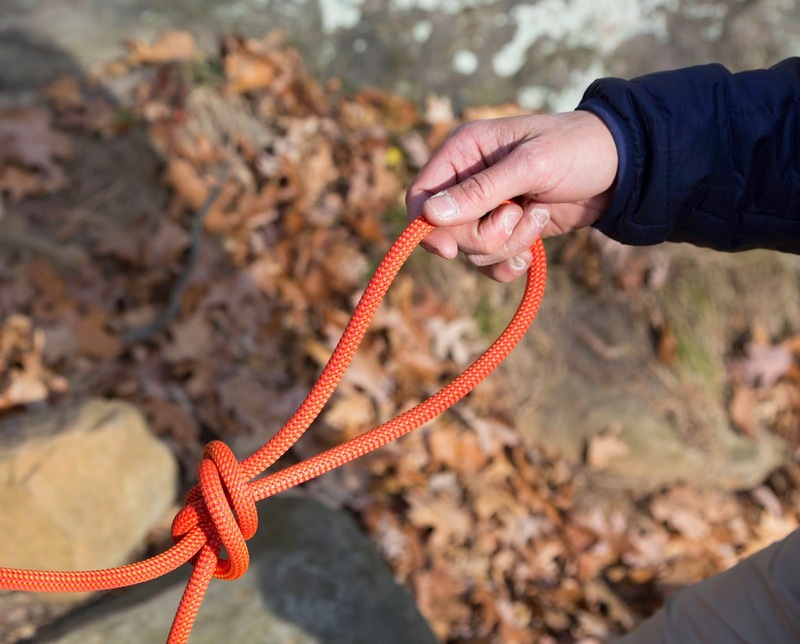 The backup knot can either be a figure-eight or overhand on a bight. 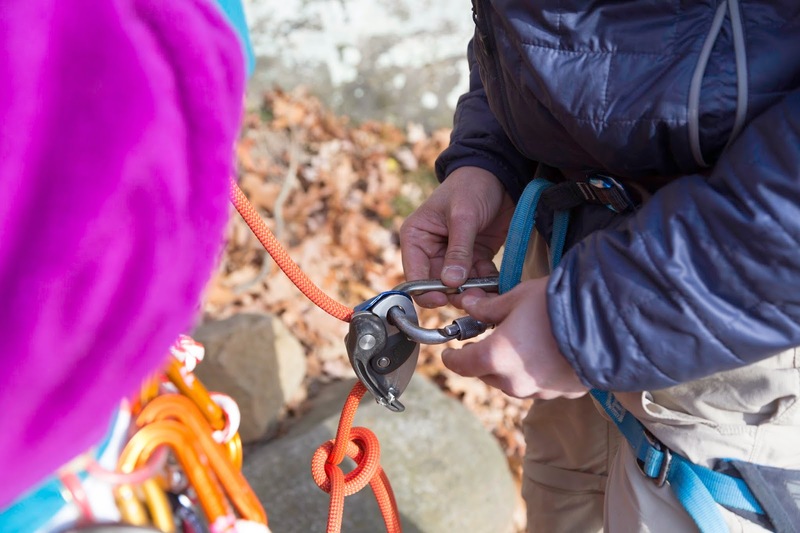 Pre-rig your assisted-braking belay device, a Grigri in this case, underneath the belayer’s belay device and clip it to your belay loop with a locking carabiner. If done correctly, the Grigri should be pre-rigged between the belayer’s brake hand and the backup knot you tied. 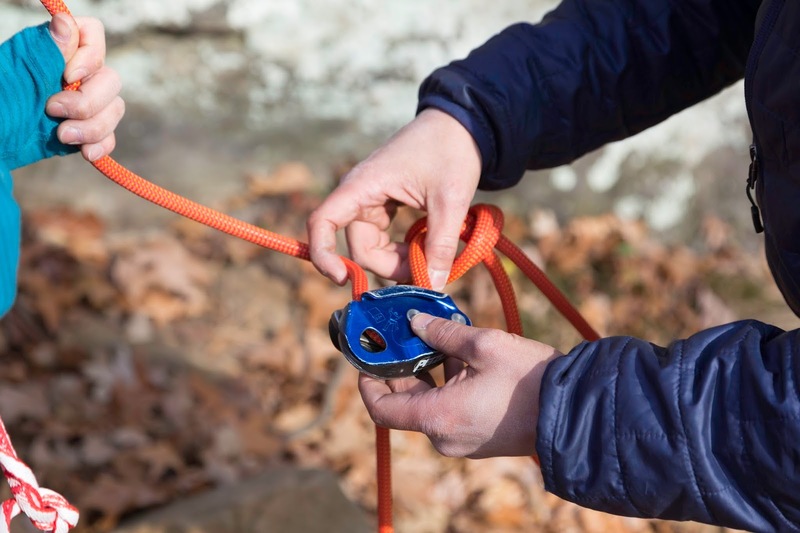 Reach over to the climber’s strand of the rope and use a friction hitch to attach a locking carabiner. An Autoblock was used in the picture above. Basket a double-length runner through the hard points on your harness and clip both ends to the locking carabiner on the climber’s strand of the rope. Run through your carabiner and knot checks and then slide the Autoblock as high as you can along the rope. 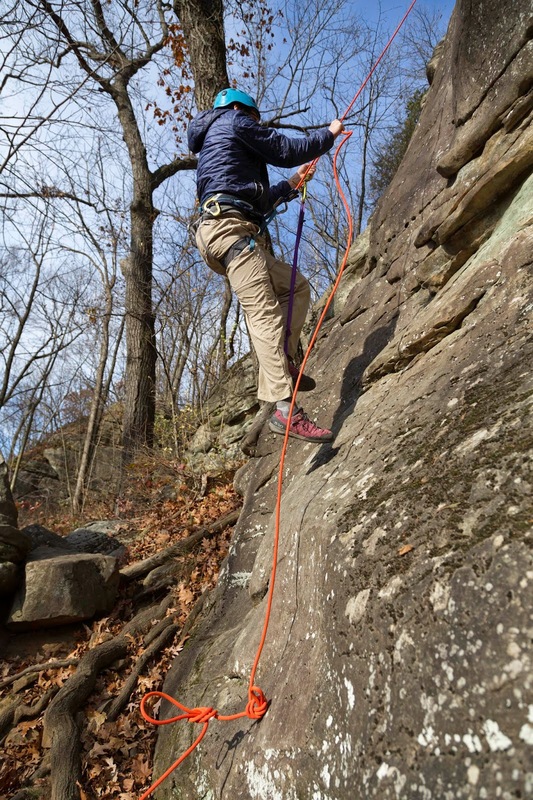 Now ask the belayer to slowly step forward as you slightly lean back. Up until this point all the climbers weight should have been on the belayer’s device. 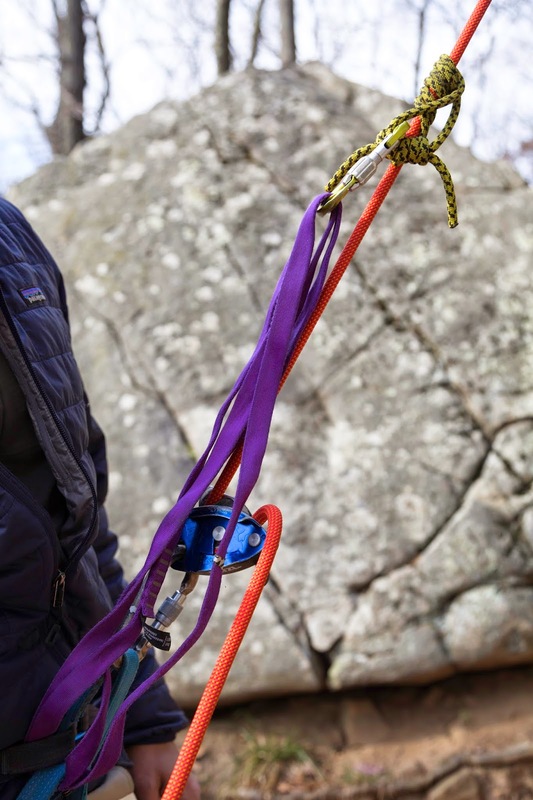 You should now start to feel the pull of the climber transition onto your harness as the Autoblock takes the weight. If done correctly, there should be no weight on the belayer’s belay device and you can ask them to go off belay. As soon as they are out of the system, pull any slack through your Grigri and disengage the Autoblock. 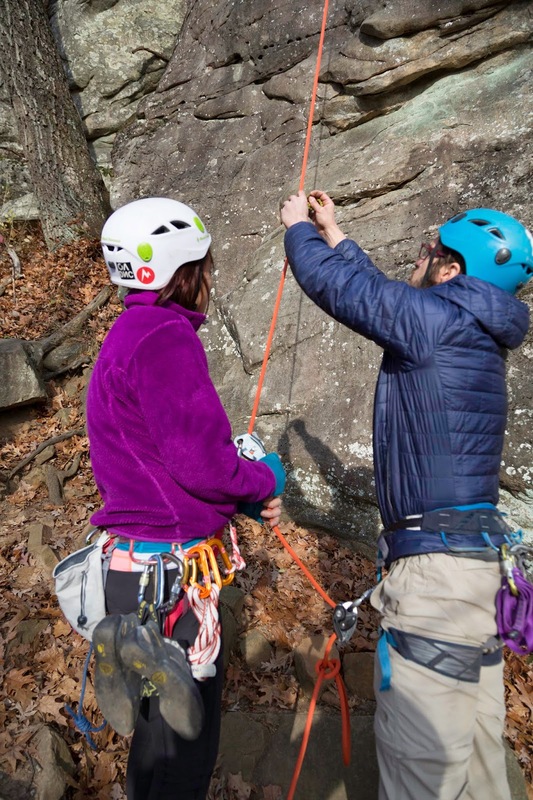 You should now be on belay just as if you were belaying from the beginning. If there is an excessive amount of slack between the Grigri and the original backup knot, start by tying a new backup knot about one to two fist lengths away from the Grigri. 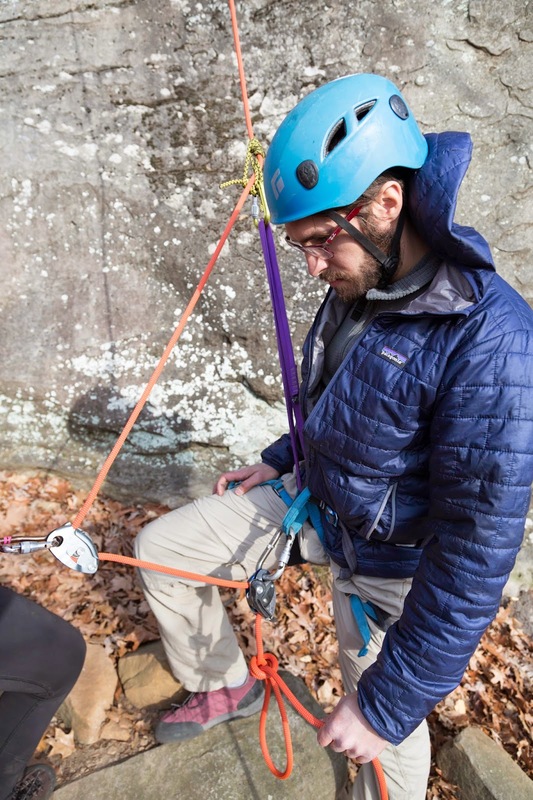 Remove the double-length runner from your harness and just let it hang from the Autoblock. To begin ascending, move as close to the wall as possible while pushing the Autoblock up. Make sure you keep the climber tight by taking in slack as you move forward. Assuming your break hand is on the right side, put your left foot inside the runner and shift your weight above that foot. This will lock the Autoblock in place and allow you to stand up your left leg. As you thrust upward, use your left hand to pull down on the climber's side of the rope and your break hand to pull up on the break side of the rope. Continue this motion until the Autoblock is about two fist lengths away from the Grigri, then sit back and weight the rope to re-engage the Grigri and capture your upward progress. At this point all your weight should be off your foot in the runner, which will allow you to move the Autoblock higher up the rope. Repeat this process until you reach the climber and make sure to tie backup knots in the break strand every 8-10' as you ascend. 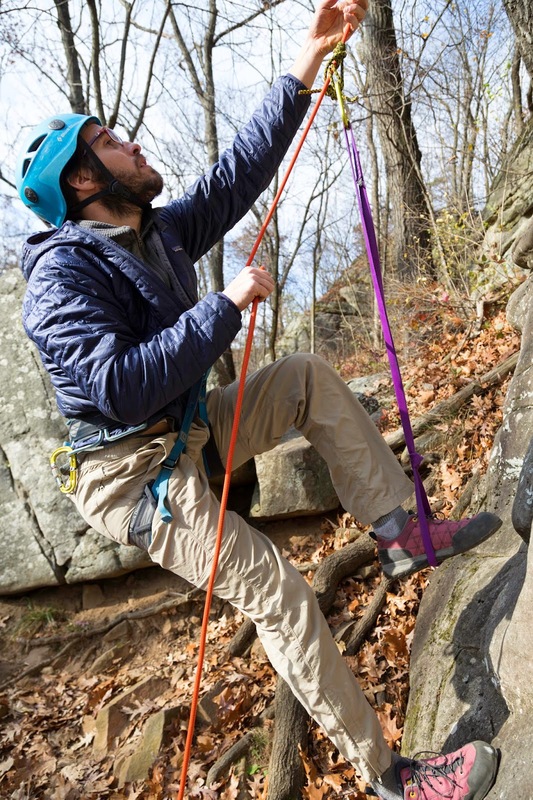 Once you reach the climber, tie a final backup knot in the break strand and untie all of the backup knots below it. If the climber is distressed, this is your opportunity to assess the situation and provide whatever aid is necessary. 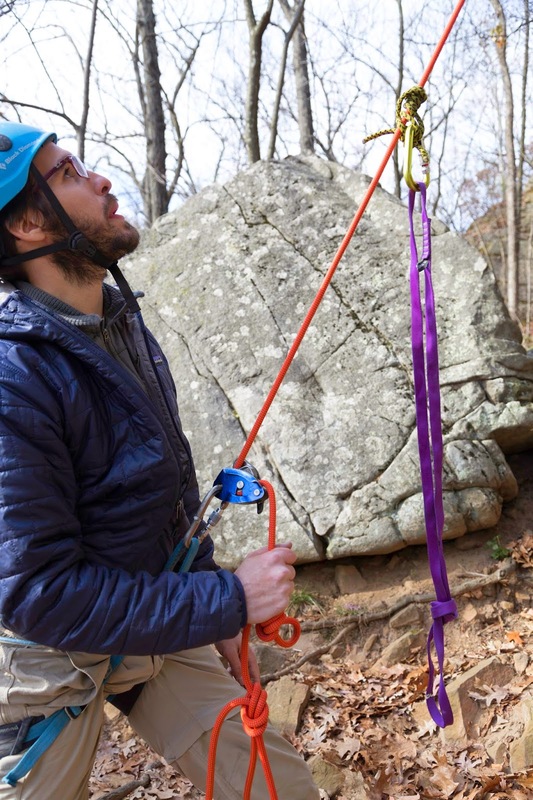 Once you decide to lower, remove the Autoblock from the strand above you and re-attach a locking carabiner to the strand above the climber with another friction hitch. I am using a Prusik in the picture above. 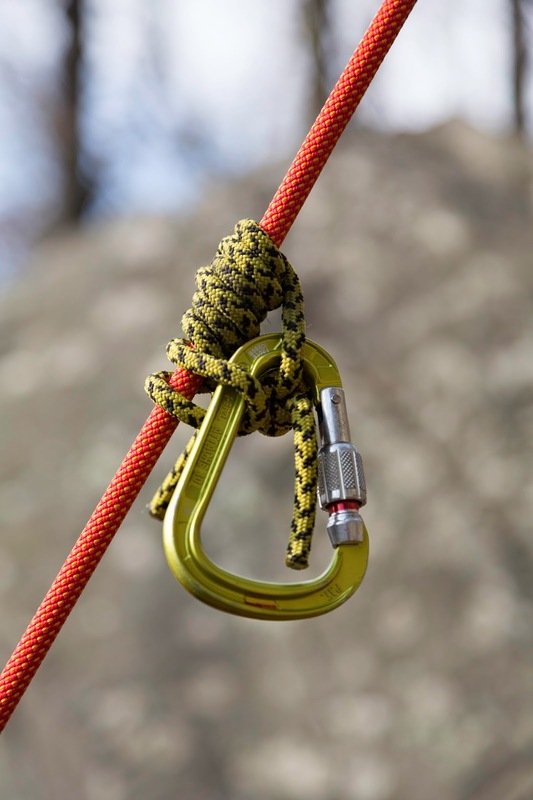 Again, basket a double-length runner through the hard points on your harness and clip both ends to the locking carabiner on the strand of the rope above the climber. Run through your carabiner and knot checks, then untie your back up knot and lower as you normally would on a Grigri. This "tricks" the system and allows both the experienced climber who ascended and the distressed climber to lower simultaneously. - In situations like above, the best solution is usually the simplest and most efficient. Before getting into a complex belay transition with friction hitches and whatever, check if the climber can comfortably unweight the rope. If they can... just tie your backup knot, pre-rig the Grigri, have the belayer remove themselves from the system, and go on belay like normal before they re-weight the rope—a much simpler solution. That said, for the purposes of this post we assumed the climber could not unweight the rope and we needed to use a hitch to transfer the load. - For ascending, you can use an Autoblock, Prusik, or Klemheist, but I personally prefer to use an Autoblock. I like the Autoblock because in my experience, the Prusik and Klemheist proved to be very difficult to disengage and slide along the rope after putting my full bodyweight on the runner. On the flipside, for lowering I tended to use a Prusik and Klemheist because I wanted a hitch that really "grabbed." This was important because I did not want to fumble around trying to get the hitch to stay in place, while dealing with the distressed climber. - Depending on your preference, you can use a slipknot or tie an overhand/figure-eight in the bottom of the double-length runner to keep your foot from slipping out as you ascend. If you do end up tying a knot, lean toward a figure-eight because it is a little easier to untie after you get to the ground. - When you get to the climber, it is a good idea to continue ascending until your feet are at about their hip to chest height. The reason you want to be above them if possible is because it is easier to offer assistance and avoids you both being right on top of each other as you lower. It also allows you to slide under their strand of rope and push them away from the wall if you need to maneuver around obstacles or roofs on the descent. With regard to the story above, something similar actually happened to me a few weeks after I took the SPI while I was teaching a beginner class at the local climbing gym. Instead of yelling up at the stranded climber for ten minutes and making the situation worse, I quickly transitioned to the primary belay, counter-ascended and talked them through the whole lowering process, right next to them on the wall as we descend together. I don't know if it made a difference in the climber's experience, but what I do know is that they came down with a smile on their face and got right back on the wall. To me, whether you are a climbing instructor, guide, or just a recreational climber taking friends out, that's what it is all about.